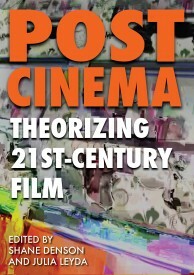 At long last, Shane Denson’s and Julia Leyda’s anthology Post-Cinema: Theorizing 21st-Century Film has come out in Catherine Grant’s Reframe Books open-access series. This mammoth anthology features some of the leading theorists of our cinematic/media moment including Lev Manovich, Steven Shaviro, Richard Grusin, Vivian Sobchack, Francesco Casetti, Patricia Pisters, Mark Hansen, and many others. It includes an entire section on “Ecologies of Post-Cinema” (which includes my chapter on cinema “in & beyond the Capitalocene”), as well as several rich dialogues on digital and post-cinematic politics. Sound great, waiting to read it!! !